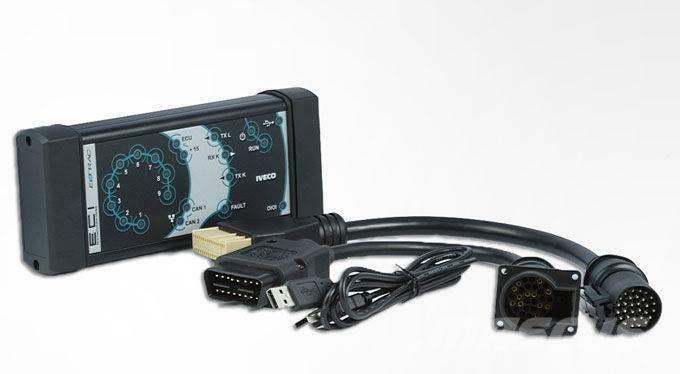 Outras informaçőes IVECO ELTRAC KIT - dealer heavy duty scan tool is PC-to-vehicle interface compatible with multiple software applications, it is available to diagnose most of heavy trucks, Buses, Grabs, Cranes and Engineering Machines. IVECO ELTRAC KIT module enables wireless communication between vehicles and diagnostic computers and simplifies and accelerates repair operations in workshops. A IVECO truck must be able to handle business-critical transports on a 24-7 basis. So fast, accurate error detection and correction is crucial for service technicians. The IVECO ELTRAC Bluetooth module is a solid, reliable solution that currently is used in thousands of repair shops worldwide. Launching new functions, features, and technologies in existing solutions is always a challenge. - Carry out Active Diagnosis’ by local checking the activation and the working of the components without the help of other operators. - A better ergonomy during diagnosis operation without the hindrance and limitations of the cable. - Check the parameters of the vehicle on-board systems during the dynamic. No Mascus Portugal pode encontrar electrónica Iveco EASY diagnostic kit, ECI, VCI, IVECO ELTRAC KIT. O preço deste Iveco EASY diagnostic kit, ECI, VCI, IVECO ELTRAC KIT é - e foi produzido em 2016. Esta máquina está localizada em Kaunas Lituânia. No Mascus.pt pode encontrar Iveco EASY diagnostic kit, ECI, VCI, IVECO ELTRAC KIT e muitos mais modelos de electrónica.